The new compact weight transmitter from METTLER TOLEDO provides the fastest connectivity to a PLC system via EtherNet/IP and PROFINET industrial networks. A new compact weight transmitter from METTLER TOLEDO, the ACT350. The ACT350 weighing transmitter from METTLER TOLEDO is designed for the needs of control system integrators and OEM machine builders. It provides 600 filtered-weight values per second for fast weighing processes with an accuracy of 10,000d. No additional software filtering is necessary to eliminate vibrations. This allows customers to quickly and cost-effectively integrate high-speed weight data into their automated PLC control systems. 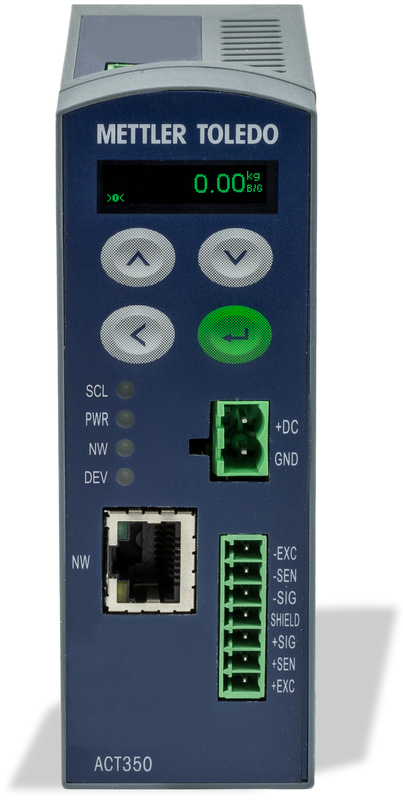 Fieldbus connectivity via EtherNet/IP, PROFINET RT or PROFIBUS is incorporated in a compact DIN-Rail unit saving cabinet space. The ACT350 simplifies the integration process by leveraging device description files making installation easy. An integrated OLED display shows weight values and can be used in combination with the keyboard to configure and receive status information. When it is impractical to place test weights on the scale, CalFree™ weightless calibration can reduce commissioning time and provide good results for tanks, vessels, silos, hoppers and conveyors.